New handyman business serves Virginia Beach, Norfolk, Chesapeake, Suffolk, Portsmouth and the surrounding communities. We can handle a variety of projects, but we really specialize in your little jobs – those small projects around the house that eat up your weekends. We want to tackle your honey-do list and help you avoid HOA violations. When Brian Rowland decided to retire from the military, he was faced with a new journey. 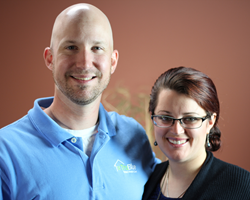 Rather than transition into the corporate world, he and his wife Rebecca decided to launch their own company – TruBlue Total House Care of Virginia Beach, which just opened for business. TruBlue of Virginia Beach specializes in providing complete property maintenance by offering handyman, maid and yard clean-up services as well as assistance with emergency repairs and home watch. TruBlue can also help seniors and families with minor home adjustments like installing ramps, swapping door handles and putting up handrails. “We liked the idea of being business owners and being responsible for our own successes and failures. We’re also looking forward being able to make an impact on the community while having more flexibility and security,” Rebecca said. This locally-owned TruBlue serves Virginia Beach, Norfolk, Chesapeake, Suffolk, Portsmouth and the surrounding communities. Brian recently retired from the U.S. Navy Submarine Force and Rebecca has spent the last five years in property management, where she specialized in setting up and training community members to run Home Owners’ Associations. The couple has four children – two boys and two girls. “I’ve done my share of handyman work over the years and Rebecca, through her experience with HOAs, understands how to properly maintain homes in order to retain maximum value. TruBlue capitalizes on our strengths and allows us to bring a great new service to this region,” Brian said. TruBlue works with homeowners, business owners and real estate professionals to maintain homes, small businesses and rental properties. By having a single source like TruBlue Total House Care handle all these tasks, home and business owners can save time on property maintenance and spend more time doing the things they love. “We can handle a variety of projects, but we really specialize in your little jobs – those small projects around the house that eat up your weekends. We want to tackle your honey-do list and help you avoid HOA violations,” Brian said. TruBlue of Virginia Beach is also a great fit for military families. By working with TruBlue, the family at home can have the property maintenance help they need and the deployed spouse can rest assured that a trustworthy company like TruBlue is on call to assist back home. In addition to the work they are doing with TruBlue, Brian serves as the Phillips Athletic Association Baseball Commissioner. Rebecca owns a small kitchen linens business and the family is involved with their church. All TruBlue franchises are fully insured and bonded and all employees are background checked. To learn more about TruBlue of Virginia Beach, call (757)544-6826, email BRowland(at)TruBlueHouseCare.com or visit http://www.TruBlueVirginiaBeach.com. TruBlue Total House Care provides one convenient and affordable solution for all your house care needs – inside and out. TruBlue’s services include home cleaning, household repairs, yard work, emergency repairs and seasonal work, all handled by a personal House Care Manger. These affordable services are available year-round and customized to meet your needs and budget. TruBlue strives to provide affordable, worry-free living for seniors and hassle-free living for busy adults with the goal of eliminating the worries, hassles and headaches of home maintenance by providing full-service, trustworthy house care services to fit any budget.